To begin, I want to note again that to date I have not found any evidence for this symbol being called the “seal of Melchizedek” by any other scholar, historian, or historical figure in recorded history before Hugh Nibley and Michael Lyon. That doesn’t mean it doesn’t exist, but it is likely a conception that began with the Latter-day Saints, making a logical connection between the symbol and the Biblical figure found adjacent to it in the mosaics. In my investigation of the seal of Melchizedek back in 2008, I came across some other depictions of this symbol anciently. One was in the mosaic “Theodora’s Procession with Retinue” from San Vitale, one of the same basilicas where the other seals are located. 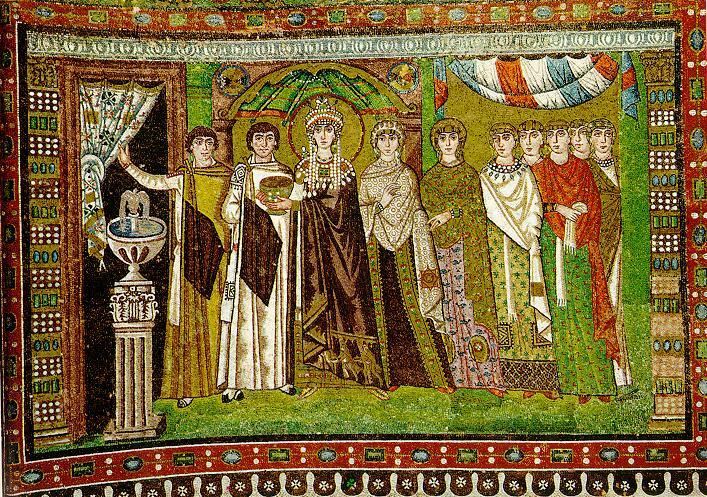 Theodora’s Procession with Retinue, San Vitale basilica, Ravenna, Italy. In addition to showing a veil being parted on the left, possibly representing the veil of the temple, and entrance to the Holy of Holies, the woman immediately to the left of Theodora is likely the royal Princess Julia Anicia. 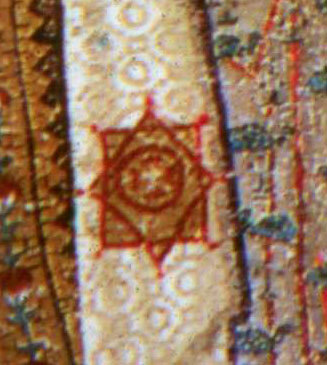 On the lower portion of her garment is prominently seen the same seal of Melchizedek, perhaps indicating her royal status. The symbol is found in more than just Christian iconography. Another place I found this symbol prominently displayed is in the Muslim world. There it has become known as the Rub el Hizb, and is dominantly used on many Muslim emblems and flags. Wikipedia notes that it may be originally found in the Quran, and to mark the end of a chapter in Arabic calligraphy. Indeed, it is even included as part of the vast Unicode family of characters, ۞ at U+06DE. It is also noted that the symbol may have represented Tartessos, an ancient civilization based in Andalusia. For Islam it is also known as the al-Quds star, i.e. 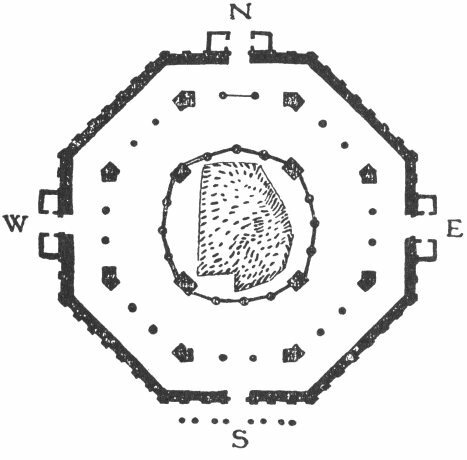 Jerusalem star, and may have ties to the octagonal ground-plan of the Dome of the Rock. Furthermore in Islam, this symbols is also related to Muhammad himself, in the form of the Khātam al-Nabiyyīn, or “Seal of the Prophets,” which designates him in Muslim belief as the last of the prophets to reveal God’s divine message. It is likely that Professor Daniel C. Peterson knows much more of this symbol’s use in Muslim culture. More can be read at MoroccanDesign.com. Again, the symbol is also found in Hinduism, where it is known as the Star of Lakshmi, and where it represents Ashtalakshmi, the eight forms, or “kinds of wealth”, of the goddess Lakshmi. The geometry of the symbol is intricately noted in mathematical formulas here, a subject which Nibley explored quite a bit in his last magnum opus One Eternal Round. Another place we find the eight-pointed star is none other than in Freemasonry, and this time it is directly associated with Melchizedek. 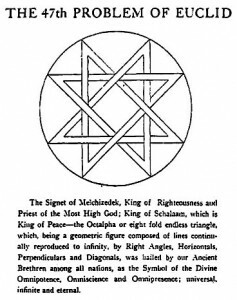 As Tim Barker has found in his post on the subject (as well this excellent overview by Tim), Henry Pelham Holmes Bromwell published a book in 1905 which extrapolates an eight-pointed star from Euclidean geometry, which Bromwell notes in the caption is called the “Signet of Melchizedek”1. While not exactly the same as the two interlocking squares that we’ve come to know as the seal of Melchizedek, this eight-pointed star certainly approximates the same shape. Unfortunately, Bromwell fails to explain how the shape has a connection to Melchizedek. Likely the original source of the name “seal of Melchizedek” is the caption by Michael P. Lyon on the photo of the mosaic from the Basilica of St. Apollinaire in Classe in Ravenna, Italy, as shown in Nibley’s book Temple and Cosmos. Since that is where the name most probably originated, speaking with Michael Lyon on the subject would possibly illuminate some things, which is precisely what Tim Barker has done, as documented on his blog LDS Studies. Lyon recalls that it may have been Nibley who inserted the words “so-called” before the term “seal of Melchizedek,” perhaps indicating his hesitancy at the name. Yet Lyon notes that he believes it was another scholar, sometime after the creation of the mosaics, that may have linked the symbol to Melchizedek, and called it the “seal of Melchizedek,” perhaps in a 19th century book on Catholic symbolism. This is the missing link that no one, including Lyon, has been able to find or confirm. 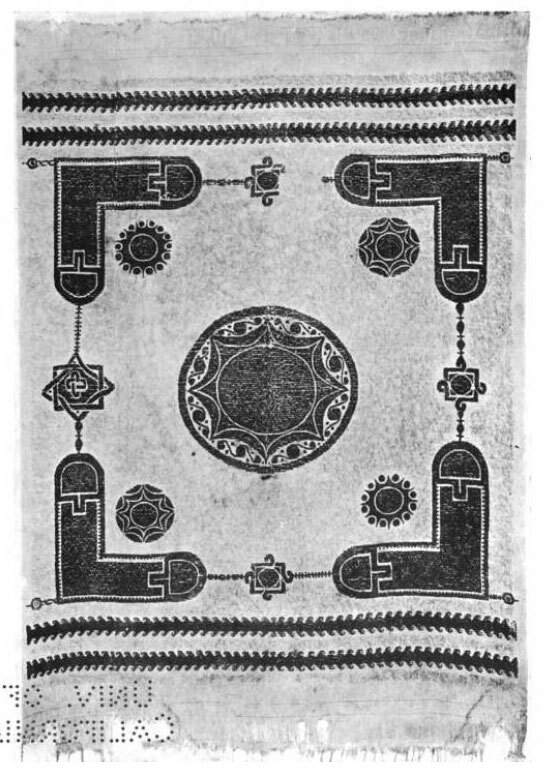 Early altar-coverings, as represented in mosaics and illuminated MSS., often had this form of decoration, and it is also to be found quite frequently in reliefs and stone carvings. The resemblance to the Greek letter gamma has given to cloths thus ornamented the name of gammadion, gammadije, or gammidae…. While there appears to be little that connects Melchizedek to the eight-pointed star symbol beyond the few mosaics in Ravenna, Italy, it still remains that Melchizedek was an enigmatic figure in the Old Testament, and much remains to be learned about him. Here are some of my thoughts as I have discussed this with others, including gleaning some from Margaret Barker’s work on Melchizedek (who, in passing, told me that she hasn’t published any thoughts about this symbol, other than considering it might be linked to “Wisdom,” which is another interesting subject I might explore in a future post). Melchizedek is an interesting Biblical figure, and Joseph Smith certainly revealed more of this important character in this dispensation. I feel that the term may be more of a title than a name, although the historical Biblical character clearly became known by that name. It is almost as if Melchizedek is the title, or new name, of one who has become a Son of God (cf. JST Heb. 7:3). Those who become heirs of God and joint-heirs with Christ become Kings and Priests of Righteousness too, or just like a “Melchizedek.” Indeed, Christ is said to be after the order of Melchizedek forevermore (Hebrews 5:6). In essence, Christ has become a Melchizedek, a King of Righteousness, a King of peace, a Prince of peace, just like we can become when we obtain a fulness of the Melchizedek priesthood. Here’s another thought, could Melchizedek have been a pre-Mosaic name for Christ, the pre-mortal Jehovah, or Yahweh? I’ve noticed that the phrase “most high God” (El Elyon) seems to be used almost exclusively in Genesis, and there only in the passage stating that Melchizedek was a priest of the “most high God” (Gen. 14:18). In earlier chapters the term “LORD God” or “Yahweh Elohim” is used, but not in this passage. It is also interesting that directly after stating that Abram gave tithes of all to Melchizedek, Abram states, “I have lift up mine hand unto the LORD, the most high God, the possessor of heaven and earth…” (Gen 14:22). Did Abram give tithes and make covenants with Melchizedek, or Yahweh, or the most high God, or could they all be considered one in the same at that point? (The phrase “possessor of heaven and earth” in this verse is also insightful as relating to the symbols of the circle and square, as explained below). BYU religion scholar Andrew Skinner notes in his book Temple Worship that the Israelites lost the privilege of having a knowledge of the “most high God” or God the Father during the Mosaic dispensation. Could the name of Melchizedek have been lost during that time, referring only to Yahweh, God the Son? Clearly, if Melchizedek was a high priest acting in God’s stead he was acting with divine investiture of authority, and so these things are hard to determine precisely. But they are interesting to ponder. Since we don’t have much in the way of texts we can draw on, maybe another tack is to think about the symbol itself. We do know something about gammadia in a priesthood context, and although we don’t know much about the completion and interconnection of gammadia into the eight-pointed star, we do know something about how the circle and square are combined, and their joint meaning in this context. To me, the intersection of the circle and square are most satisfactorily explained in terms of the coming together of heaven and earth in both the sacred geometry of the temple and the soul of the seeker of Wisdom4, which might be equated to the culminating blessings that follow as an eventual consequence of having received a fulness of the Melchizedek Priesthood. If the Latter-day Saints want to ascribe this symbol as a representation of Melchizedek, his Priesthood, and therefore after the order of the Son of God (D&C 107:3), our Savior Jesus Christ, and call it the “Seal of Melchizedek,” then why not? That’s what symbols are. I was in the Karachi airport on a business trip and I realized I was surrounded by this symbol. It is part of the decor of the baggage claim/ customs area. I haven’t read all 5 articles but I wonder if this symbol has a specific meaning in Islam? I have a grainy cell phone picture I would be happy to send you. Yes, this part discusses Islam. Were there Sunstones before Nauvoo? How about the long pointed 5 stars? LDS have a rich history of making symbols in addition to discovering or reinterpreting ancient symbols. Thanks for the work on this article. Thanks Bryce, sorry I missed that the first time through….good stuff. In terms of understanding the symbolism of this shape, there are few elements that should be noted. 1. this shape is part of a family of geometry which is derived from the square, which suggests an association with transcending the limits of earth and material creation. 2. this shape is inseparably related to the octagon and the number 8. In Islam the throne of God is borne up by 8 angels. 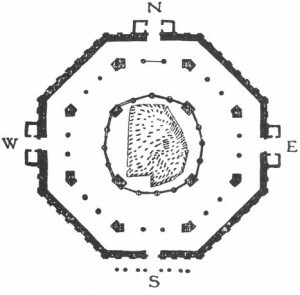 Further geometric analysis of the Dome of the Rock floor plan will reveal that the placement of columns, etc is governed by the seal of Solomon. 3. architecturally speaking, the octagon is a transition shape between a cube (earth) and a sphere (heaven) and therefore occupies a symbolic space which is very easily associated with prophets, Christ, and temples. Also, baptismal fonts in European churches are quite commonly octagonal. There are some pretty compelling reasons why LDS members could get excited about this symbol, but like Gaskill, I’m am deeply dubious that it has an ancient association with Melchizedek. If anyone is interested, I will be teaching a workshop on Islamic geometry at the BYU Museum of Art on September 7, 2012 and will be focusing on this shape, its symbolism in Islamic art and architecture, and how it is constructed using compass and square. Interesting thoughts Lisa. Thank you. Question, isn’t the Seal of Solomon (or Star of David) made up of of 6-pointed star (2 interlocking triangles), not eight-pointed (2 interlocking squares)? Also, since we find this symbol on the 6th century mosaics of Ravenna, right next to Melchizedek, there seems to be at least some, however minimal, connection there. Why would the Seal of “Solomon” appear in the mosaics? How does Solomon figure in? I’d be interested in attending your workshop at the MOA. As I mentioned above, yes, the Star of David is also often designated the Seal of Solomon and I don’t have a good explanation for why the name would be applied to both symbols. When you get into drawing these shapes with the compass, there is close correlation between three- and six-fold designs with the circle, whereas four- and eight-fold designs are connected to the square. If I were demonstrating this visually, I’d suggest that the six-fold Seal of Solomon might be representing communication from heaven to earth, and the eight-fold Seal might be representing the transformation of the earthly into the heavenly. This same correlation of the heavenly point of view with six-fold geometry and the earthly with four-fold geometry is suggested by Ibn Arabi. (can’t remember exactly where right now) Sorry if this is unclear — I’m used to being able to draw pictures to explain this stuff rather than having to write it! I don’t think that the eight-pointed star is exclusively associated with Solomon, but the association is strong throughout the Islamic world. I don’t know at what point in Islamic history that the association would have been made and I certainly don’t intend to argue that the symbol that we see in the mosaics should be connected to Solomon. Since we don’t see this symbol associated with Melchizedek outside of Ravenna, but we do see it in many other priestly settings, I would argue that Melchizedek is being marked as having a priestly role in these mosaics, rather than the symbol being a marker of Melchizedek specifically. Thank you Lisa. Is it possible that the Islamic world originally borrowed the symbol from the Byzantines to incorporate into their theology? Where did Islam get it? It’s possible, and you could certainly find examples throughout the Byzantine world. I confess that find it problematic and limiting to establish a single line of transmission since it’s such a simple symbol. It’s the sort of thing that anyone doodling would sketch. It is a shape that appears spontaneously as soon as a designer starts working with squares. (I think this is what was happening in the San Diego temple design process.) You don’t really need to have someone teach it to you. What would need to be taught would be specific meanings associated with it. One possible source of the esoteric associations with specific Islamic designs comes via discussions around the translations of Euclid that the Brethren of Purity were working with in Baghdad in the 10th century. It also occurs to me that the eight points of the symbol are reminiscent of eight sets of upraised arms surrounding a central circle. Some have asked me what my reaction is to Alonzo Gaskill’s article. He is certainly very negative about the connection between the symbol and Melchizedek, and even takes some shots at me, Hugh Nibley, and others. Indeed, there may have been no significant connection between the symbol and Melchizedek in ancient times, as Gaskill so readily point outs. But, we do not know for certain. History is not an open book. There may be more to be discovered. Gaskill is being very dogmatic in his assertions, and unwilling to explore further, which is a shame. The fact is this—today there is a significant connection between the symbol and Melchizedek as has been demonstrated by Hugh Nibley, Michael Lyon, President Hinckley, President Faust, the architects of many temples, Mormon paraphernalia, Mormon books, Latter-day Saints, myself, and many others. It is very apparent to me that the Saints want the symbol to stand for Melchizedek, his priesthood, and by implication, our Savior Jesus Christ. I see nothing wrong in that. Gaskill disagrees strongly, for some unapparent reasons. Maybe I need to sit down with him and talk about it. For one who has written so many books about gospel symbolism, and has such a tremendously well-educated background in religious studies, Dr. Gaskill should know better. Symbols are what we make of them; they do not stand independent of humanity, in a vacuum. The critics of the Church use similar arguments as Gaskill does to show that the pentagram is not a symbol of Christ, but a symbol of the devil, and therefore its use on our temples such as in Nauvoo is a display of our utter depravity. No. Dr. Gaskill, symbols are flexible instruments that reflect an understanding of a particular people in their own time, space, and culture. People make symbols, and attach meaning to them. If the Latter-day Saints want to adopt this symbol to represent Melchizedek, I see nothing wrong with that. Would not such help us to more often reflect upon the Savior, whose priesthood it is? I find it interesting how much the seal on the coptic clothe looks like the mirror of yata the most sacred thing in all of Japan believed to have been given to the first japanese from the creator Gods. This is the mirror cared for by the shito priest that the emporer looks into to see the face of god during the corination of the emporer. I’m not a LDS but this figure has me currently very interested. I personally think it is fine to call it the seal of Melchizedek for a whole lot of reasons I’ll start to make clear. We have to remember that in ancient times and even well into the Christian era, people told history with stories and pictures. Artists dedicated to God’s service (like icon painters) portrayed the numinous sense of God’s presence as well as they could by using stylised idioms and heightened imagery, to convey things that literally came from another dimension. I have no doubt that they would be inspired by dreams, day visions, and even just a sense of heightened perception. Therefore we can, with care, read into the Ravenna mosaics by using our own faculties of sensitive perception, as well as simply noting unusual facts. Like, how come both Ravenna churches portray Melchizedek in preference to lots of other Hebrew Bible characters? To unravel this puzzle a bit further, one might do well to investigate Procopius’ Secret History (see A.R.E. research on this) about Justinian and Theodora who both appear in Ravenna. Justinian gathered the Fifth Ecumenical Council, it seems, just to “anathematize” the saintly Origen of Alexandria, pupil of Clement. Why? It could well have been because Origen taught esoteric Christian studies like reincarnation. Perhaps, after Justinian, nobody in Christendom understood any more about the esoteric significance of this eightfold star. Or is that all that Google can help us track? Why is it such a favourite in Islamic culture? One would do well to reflect on Islam’s inheritance, the great stargazing civilizations of Mesopotamia and Persia. Zechariah Sitchin may have had highly fanciful theories, but he does show evidence that these cultures may well have had close contact with “star beings”. Doesn’t the language used to describe Melchizedek remind one of the priest-kings of Mesopotamia? Doesn’t it suggest Melchizedek was a star-being himself? You LDS ought to be sensitive to these things! I’ve had dreams about this, and more, and am in no doubt about all this.